Martha Maxwell founded learning centers at American University five decades ago, at the University of Maryland 30 years ago, and at the University of California-Berkeley in 1973. The Annual Institute for Learning Assistance Professionals (now the Winter Institute) began under her direction in 1977. She is the author of Skimming and Scanning Improvement (1968), Improving Student Learning Skills (1978), and Evaluating Academic Skills Program: A Source Book (1991, 1996) and Improving Student Learning Skills: Programs and Practices for Working with the Underprepared College Student, a new, revised edition of which was published in 1997. She also edited When Tutor Meets Student (1991, 1994), and From Access to Success: Readings in Learning Assistance and Developmental Education (1994). Since retiring from Berkeley in 1980, Martha has been writing, consulting, mentoring, and revising the CAS standards for learning assistance programs. 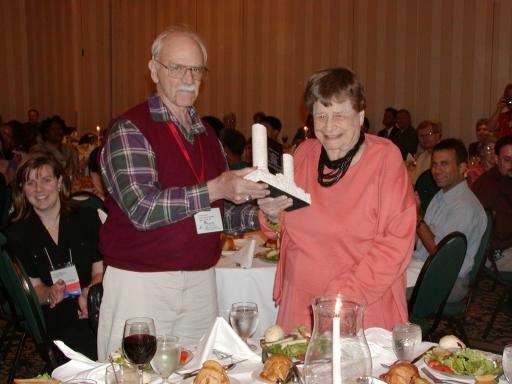 Laura Mattingly from Midlands Technical College in Columbia, South Carolina, had this to say: “I was indeed very excited to see Martha receive the NCLCA Lifetime Achievement Award at the recent conference. As a learning center professional, I am very thankful for Martha’s early ground-breaking work in the field of developmental education, tutoring, and especially learning assistance centers. I have often referred to her helpful passages of text in the course of my studies. It was nice to see Martha recognized among her distinguished colleagues for her fine efforts, and I very much enjoyed this special tribute."